Yonkers, NY – Mayor Mike Spano and City Council President Liam McLaughlin joined Empire City Casino and Yonkers-native Pat Quinn for the third annual ALS Ice Bucket Challenge Saturday, August 5 at Empire City Casino. 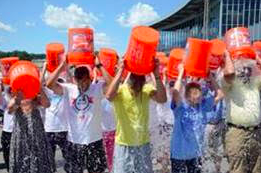 The free festivities, music and family-friendly entertainment attracted hundreds of participants simultaneously dumping ice-water over their heads. Empire City Casino is donating the entire set-up and staffing, as well as nearly 1,300 pounds of ice for all of the participants’ buckets, and will also provide entertainment, face painting, balloon artists, and giveaways to the first 500 attendees. The public is encouraged to pre-register online at YonkersNY.gov. Amyotrophic lateral sclerosis (ALS), often referred to as “Lou Gehrig’s Disease,” is a progressive neurodegenerative disease that affects nerve cells in the brain and the spinal cord. ALS, a disease with no known cure, usually strikes people between the ages of 40 and 70. Approximately 20,000 Americans currently suffer from the disease. Pat Quinn, 34-years-old, was diagnosed with ALS in March 2013. “I’m beyond grateful for the continued support from Mayor Mike Spano, City Council President Liam McLaughlin, and the entire City of Yonkers. I’m extremely proud to know Quinn for the Win and Yonkers continue to fight ALS together. We live by the mantra, ‘Every August Until A Cure.’ There is greater hope within the ALS community now than ever before because of the Ice Bucket Challenge, but we can’t stop now. We still have no cure for ALS. Please join me August 5th at Empire City Casino to kick-off the ALS Ice Bucket Challenge in Yonkers. Not only will it be fun, you will be a part of something special,” said Pat Quinn. Proceeds from the event will be donated to Quinn for the Win which benefits Pat Quinn’s care as well as not-for-profit ALS research organizations.